While some of the communities along the western end of the trail, such as Palos Heights, have some existing trails for bicyclists and pedestrians, many of the other communities along the eastern end, including Burnham, Riverdale and Dolton, are towns with little, if any, trail infrastructure. Many of these suburbs have been severely hurt by not only this recession but by the closing of factories and steel mills decades ago. In September, for example, MetroSouth Medical Center in Blue Island laid off 120 workers, or about 10 percent of its staff. Hospital officials cited the recession and an increasing number of patients who couldn't afford to pay their medical bills. 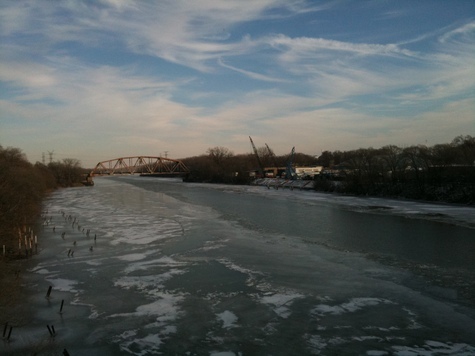 In addition, after years of neglect and industrial use, the Calumet River and Calumet-Sag Channel aren't exactly known for their natural beauty, as many factories operated along the waterfront, often leaving a toxic footprint behind in a waterway once used by Native Americans for trading. Some factories continue to operate near the waterfront while other abandoned ones leave a ghostly industrial presence behind. The Calumet River system spans more than 100 miles from Lake Michigan, running through the South Side, south suburbs and northwest Indiana. It includes the Calumet River, Little Calumet River, Grand Calumet River and Calumet-Sag Channel. As Christopher Thale notes in his entry for Encyclopedia Chicago, the Calumet River system includes a "network of waterways, some human-made and others transformed by two centuries of human straightening, widening, dredging, channelizing, and damming, as well as by industrial pollution and landfilling of nearby marshes." In the early 20th century, as downtown expanded "and heavy industry found itself short on space... developers and industrialists turn[ed] to the Calumet area, where they could still enjoy proximity to Chicago's transportation, markets, labor force, and business services." In 1922, as interest in the Calumet River system's industrial potential grew, the Metropolitan Sewage District dug the Calumet-Sag Channel ("Cal-Sag Channel"), which runs about 16 miles in total from the Little Calumet River to the Sanitary and Ship Canal. The channel and canal helped reverse the flow of the Calumet River, steering sewage away from Lake Michigan. The Cal-Sag Channel also served as a commercial route for the Illinois Waterway System, and it's still fairly common to see barges cross the canal. Since then, efforts to clean up the waterway have made some progress, thanks in part to the federal Clean Water Act of 1972 and the Deep Tunnel plan. In the 1990s, the villages of Blue Island and Worth spent millions of dollars to build five Sidestream Elevated Pool Aeration (SEPA) stations. Often called "man-made waterfalls," these SEPA stations help treat waste water by giving the water more contact with the air, thus pumping more oxygen into the water. As a result of these clean-up efforts, beavers, Canadian geese and herons now flock to the area. Steve Buchtel, a Homewood resident who works as the Southland coordinator for the Active Transportation Alliance, sees the trail improving not only the well-being of residents who live nearby but also spurring economic development for the communities along the trail. Buchtel, a member of the non-profit Friends of the Calumet-Sag Trail, has worked for years with other organizations to help spark interest in the project. He notes that currently, several south east suburbs are struggling to find economic bases, and traffic from east-west is often a congested nightmare for commuters. With Pace service cutbacks, rising obesity rates and ballooning poverty rates in suburbs, he and others argue that this trail is one step in improving the quality of life for several south suburban residents. "We know quality of life isn't affected just by jobs," he says. "It's affected by access to open space. It's affected by mobility options. Are you hemmed in by expressways? Do you have good transit service in your town? It's affected by health infrastructure - what are the things in the community that allow you to be active, that allow you to maintain good health?. I know from a political perspective, it's an important message to say, job, jobs, jobs. But I think if you ask every individual in all of these communities, which would you rather have: good health, safe places for your kids to recreate or a job? I think the job is going to be less of a priority than their own personal well-being and the well-being of their family. So the trail is going to exist for people who have jobs, it's going to exist for people who don't have jobs. It's going to exist for old people and for young people. It's going to return value to the community no matter what the economy does." Buchtel points to one analysis provided by the University of North Carolina Highway Safety Research Center which says the Calumet-Sag Trail could pump in almost $5 million a year in recreation-related income, create $176,000 in health savings and lure 1,400 new cyclists to the area. 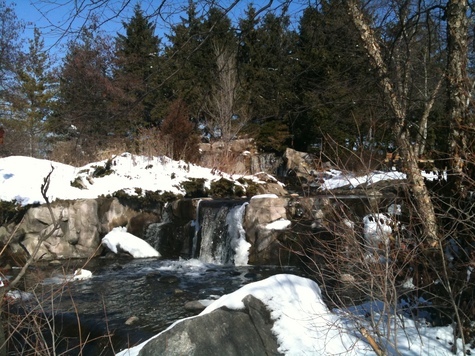 Portions of the trail are expected to open by 2012, and the project's completion relies on federal grants and private donations. So far, phase one and two of engineering has begun on the western end of the trail, thanks to $300,000 in National Transportation Enhancements funds and a $424,948 grant from the U.S. Department of Transportation's Congestion Mitigation and Air Quality Improvement program (CMAQ). Engineering phases generally look at alignments and preparation for construction, according to David Landeweer, a senior manager at URS Corporation who is studying the project. Landeweer says getting underneath bridges and railroads will be the most challenging part of the project, though not entirely impossible. So far, a small section of the trail -- about 1/8 of a mile -- opened in Palos Heights' Lake Katherine Nature Preserve in 2008. A little after Palos received its first grant, Blue Island was awarded a $1.2 million grant from CMAQ to complete preliminary surveys on the eastern end and to begin phase one and two of engineering. Buchtel says Senator Richard Durbin's office also awarded the project $268,000 to create a master plan for the trail. All 14 communities have signed an inter-governmental agreement and are expected to contribute a 20 percent match for grants awarded. "We're hoping it will spur some economic development along the way with bike shops, novelty shops, whatever people can use, a stand where people could stop and get refreshments to quench their thirst, and things like that on the trail," says Robert Polk, village president of Burnham. 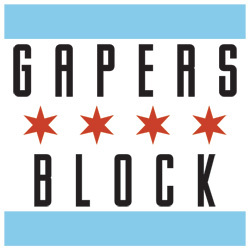 "As far as the Burnham part goes, if there was an area [where residents] could park their bikes and catch the train to go to downtown Chicago, things like that would help the area and help to spur economic development and growth and create some jobs for the region." Burnham is one of the towns struggling to recover its economic base. Polk, who also works as a mechanic for ArcelorMittal Steel, says he sees residents bike riding along Torrence or Burnham Avenues without trail or bike path options. He awaits a point where those riders can bike along the Calumet-Sag trail, even if finding some of the funding for the project will be difficult. "It will be somewhat challenging because we have a lot of issues, housing market foreclosures and those sorts of things," he says. "We're trying to manage and get through it." Buchtel of the Active Transportation Alliance adds that in addition to creating scenic routes along the riverfront akin to those in Naperville and Lockport, the trail could also help honor the industrial past of the south suburbs. "There are some places in the world where industrial architecture is a celebrated thing -- that hasn't been the case in the southeast suburbs. It's something that just passes by without notice," he says. "[For example] Mittal Steel [now part of ArcelorMittal], that's where a lot of steel for the Sears Tower and John Hancock building, it came out of that plant. There's a legacy there of city builders that most people don't see when they pass through Riverdale and Dolton right now. 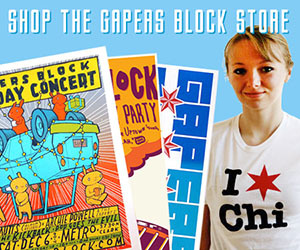 How much of Chicago's wealth has come through those rail lines that drive everyone crazy? A lot of it, but again, that's a historical legacy that's not told or not recognized. I think Calumet-Sag Trail is going to bring a lot more recognition to the role those communities played in making the Chicagoland what it is today." 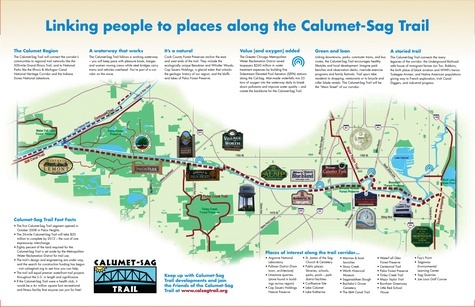 Stay connected about the project at the Friends of the Calumet-Sag Trail's Web site, or become a fan of the trail on Facebook. This is a great article. I think it's the most comprehensive write-up of the past, present, and future of the trail and the surrounding cities. I support the trail and I live over 20 miles away. I know it will be good for the residents. Awesome video I must say and great figures and information in "BUILDING TRAIL INFRASTRUCTURE". Thank you! Useful materials for my research paper in high school!